Ptolemy XV Philopator Philometor Caesar, nicknamed Caesarion (little Caesar; Greek: Πτολεμαίος ΙΕ' Φιλοπάτωρ Φιλομήτωρ Καίσαρ, Καισαρίων; June 23, 47 BC – August, 30 BC) was the son of Cleopatra VII. 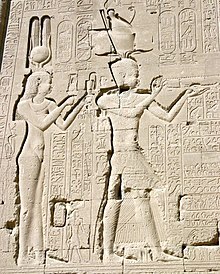 He ruled Egypt as a child along with Cleopatra until 30 BC. He was murdered by Octavian, who would later become the Roman emperor Augustus. Caesarion is probably the son of Julius Caesar. If so, he is the only known son of Caesar. Caesarion was the last king (pharaoh) of the Ptolemaic dynasty of Egypt. This page was last changed on 1 March 2018, at 04:44.